The anterior segment is the portion of the eye in front of and including the iris. The anterior chamber is filled with clear fluid (the aqueous humor). 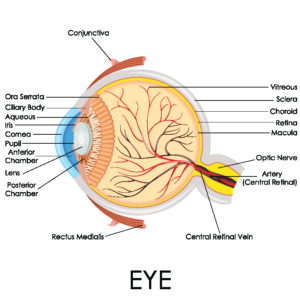 The cornea and the tear film overlying it are the major refracting surface of the eye, stronger even than the lens inside. The conjunctiva is the clear tissue covering the white of the eye (sclera). It could be considered the skin of the eye. 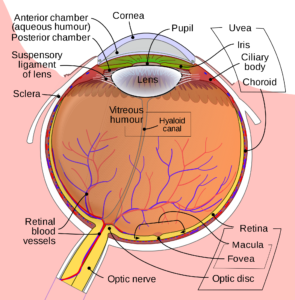 The area where the lens is suspended, held in place by the zonules, is called the posterior chamber. Deeper still is the vitreous cavity, filled with a transparent jelly called the vitreous.